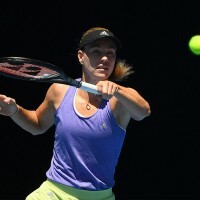 Two-time finalist and top seed Angelique Kerber worked her way through a tight opening round match at the Abierto GNP Seguros on Tuesday night, defeating Slovakia’s Kristina Kucova, 7-6(4), 6-2. The 2013 and 2017 runner-up in Monterrey, Kerber needed to fight through an opener in which she led by two breaks at 3-0, and also served for at 6-5, in a tiebreak, before easing through to a 91-minute victory. The three-time Grand Slam champion scored her third straight win against the former Top 100 Slovak, and ironically, second in this week in the calendar, having also beaten her at the Volvo Car Open in Charleston three years ago. “I was expecting a tough match, because I’ve played her many times already. She’s a tough opponent,” Kerber said on-court after the match. “I was trying to play a good match, play aggressive. I’m so happy to be back here in Monterrey. I’m feeling like home here. It’s great to have a good first round.